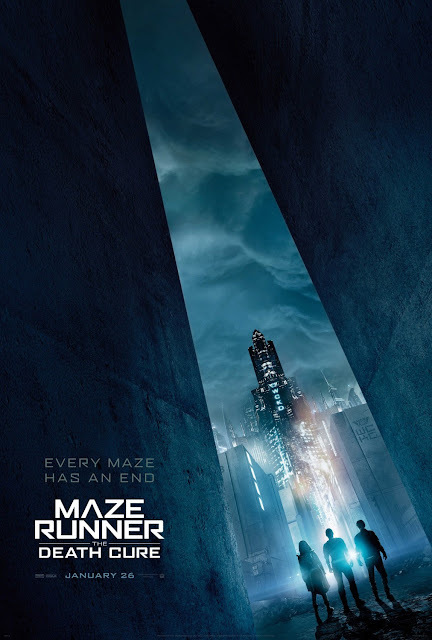 Movie: "Maze Runner: The Death Cure"
Thomas and the remaining Gladers try to rescue their captured friend Minho and the rest of the immune from WCKD with the help of resistance group The Right Arm so they can be taken to a safe haven to live in peace. Finally, after many years, we have come to the end of a journey. Not only is "The Death Cure" the final film in the "Maze Runner" franchise, but it is also one of the last stragglers riding the high point of the post-apocalyptic young adult novel adaptation fad. Between the "The Hunger Games," "Divergent," "The Giver," and this series, it started to feel like an overcrowded marketplace for a while. Two of those titles failed to reach completion, one completely ran its course, and now, "Maze Runner: The Death Cure" is here to finish off yet another franchise. This film is once again directed by Wes Ball, who has helmed the series since the beginning. It is written once again by T.S. Nowlin, who has written the screenplay for every installment, all of which are based on books by James Dashner. Dylan O'Brien returns to reprise his starring role as Thomas, who has had a special place in this world from the beginning. Once an employee of WCKD, he now fights against them. In this installment, Thomas seems determined to rescue Minho, played once again by Ki Hong Li, and must infiltrate WCKD to do it. All the while, WCKD continues its quest to hunt for the remaining immune to harvest a serum from their blood that can one day hopefully cure the Flare virus. The remaining cast members return as well, including Thomas Brodie-Sangster, Dexter Darden, Rosa Salazar, Kaya Scodelario, Patricia Clarkson, Giancarlo Esposito, and Barry Pepper. It really is quite a cast. When a big series like this get adapted into a movie franchise, people always ask, "if I haven't seen the previous ones, will I understand this latest installment?" The answer here is a resounding no. The first two films are required viewing in order for you to fully understand this final chapter of the saga. "The Death Cure" picks up just a short time after the events of "The Scorch Trials." Like this previous installment, there's no recap and there's no extra character building. At this point, it is expected that the audience already knows who everyone is and what the characters are out to get in general. The action in this series has gradually been ramped up more and more as it has moved along its timeline. The first installment was like a suspenseful monster movie, the second was a zombie action flick, and the third hits levels of a full-on dystopic war picture at times. Dylan O'Brien as Thomas has always been the central character in this series, but here a couple of other members get their moment to shine. Brodie-Sangster and O'Brien have some excellent scenes together and we think both of them have potential to go far as actors. Seasoned veterans Barry Pepper, Patricia Clarkson, and Giancarlo Esposito have very little to do in this installment and it seems they disappear for long stretches of time. Then again, this is a story about the Gladers. The other actors pretty much do what they have continued to do throughout the series. The one major problem with "The Death Cure" is its length. It feels like it could have easily been shaved down by 15-30 minutes without much consequence. Also, the dialogue isn't great. There are a good amount of cheesy lines, but what do you expect from a series where the bad guys are literally called WCKD (pronounced wicked)? The acronym stands for 'World In Catastrophe: Killzone Experiment Department.' This tells us the author really wanted the evil company to be abbreviated WICKED (exactly how it is abbreviated in the books). If you can wade through the mediocre young adult dialogue and its overlong runtime, "Maze Runner: The Death Cure" manages to be a solid sci-fi action flick that is a fun and entertaining watch. If you liked the previous two installments, chances are you will likely enjoy this one as well. If you didn't like or haven't seen the previous two, what the heck are you doing watching this one? Of course you won't like it!